Orlando Drink and Draw (ODD) ventures to a new bar or restaurant each month to sample beers and sketch. There is no model fee and no instruction. This is just a chance to get out, meet fellow artists and draw. I'm hoping to sketch in Central Florida's best dive bars, so suggestions are always welcome. Wendy Wallenberg suggested we go to Thai Island (2522 S Semoran Blvd, Orlando, FL 32822. Thai Island is a casual spot for familiar and country-style regional Thai dishes in a quaint setting. 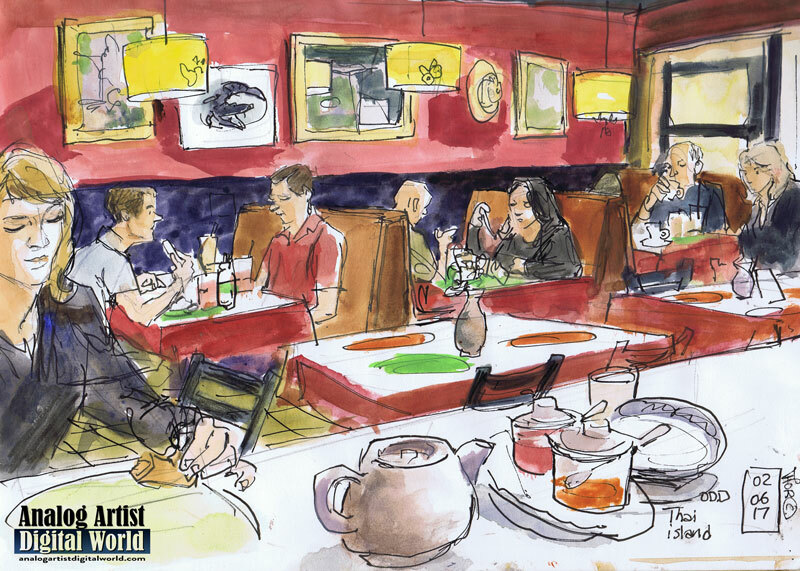 About four artists showed up and sketched while sampling the dishes. I had a spring roll with the accompanying sauces on the table was good but didn't order a full meal. Artist Orit Reuben stopped out and worked in pastels which was a colorful alternative the watercolor sketches I do each day.